Temple of Kom Ombo is an Egyptian religious complex that was built in the Hellenistic period and continued to exist during the Roman era. 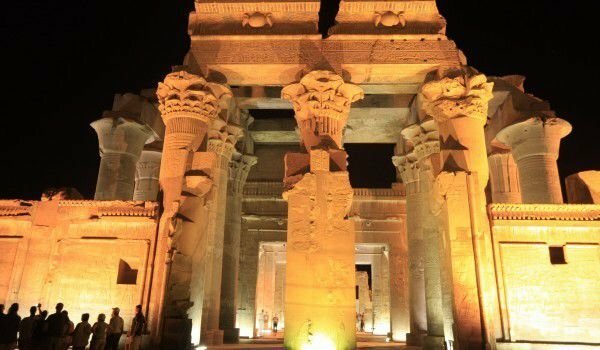 Temple of Kom Ombo is located 4 kilometers from the town of Kom Ombo, 50 km west of the famous Aswan - the southernmost city of Egypt. The ancient temple complex stands on the bank of the Nile between Aswan and Edfu, making it one of the mandatory stops on tourist cruises on the river. Kom Ombo is a popular tourist destination, and before the temple lies an impromptu Arab market. Kom Ombo is unique in that it's actually religious complex of two joined temples dedicated to two deities. Right (south) side of the temple is in honor of the god Sobek, who has head of a crocodile and is god of fertility and creator of the world. Left side (north) of Kom Ombo is dedicated to the god Haroeris or falcon-headed Horus, who is master of solar war. His winged image keeps away all evils, is plotted over all portals of Kom Ombo. It is assumed that Kom Ombo was built in the Ptolemies era between 180-145 BC, at the site of much older and smaller sanctuaries, where today is very little else. Construction of the sanctuary was by Ptolemy XIII, between 51-47 BC. In mythology, Sobek was associated with the god Seth, the enemy of Horus. Sobek's allies managed to escape from Horus, as modified crocodiles. That’s why god Sobek has a crocodile's head. First, the crocodile is considered a demon, of which the people of the Nile are very afraid. The rise in the worship and deification comes in trying to tame crocodiles for people to reduce the risk of them. Over time, even Sobek became a symbol of fertility in the land of the Nile. So Sobek became a fierce deity, wrapped in a halo of charity. The two temples of Kom Ombo are equally symmetrical, each temple has its adjoining entrance, galleries, corridors. The temple is entered through a large staircase on two levels. The input columns are preserved almost intact, and you can see images of animals, birds, fruit and surgical instruments. All that is left of the entrance pylon is a depiction of the Roman emperor Domitian, which pays homage to the sacred triad - Sobek, Hathor and Khonsu, and long text lines with 52 characters. Later impression remains of 16 colour columns on three sides. See the ruins of an altar in the middle of Kom Ombo, and the spelling of many places named by the Emperor Tiberius. In the hall in the temple of Horus Kom Ombo, you can see interesting columns and astronomical scenes on the ceiling. Perhaps the most interesting part of the complex is the place where there are few mummified crocodiles found in the area of Kom Ombo. They are placed in special glass cases. The large religious complex has a small pavilion called the Birth House or the Chapel of Hathor. The right of the temple was built by Domitian in honour of Hathor, whom the Greeks identified with Aphrodite .